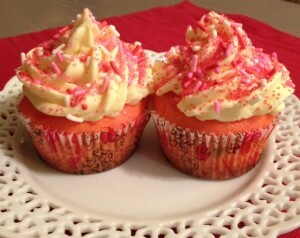 Love is in the air…or is that just the smell of cupcakes in the oven? Either way, these cupcakes will have you channeling St. Valentine in no time. A classic vanilla cupcake combined with the tartness of pink lemonade is just the incentive needed to pucker up and smooch somebody. This lemony tart concoction is perfectly complimented by a sweet butter cream frosting and packs a deliciously sweet and sour punch. Oh and they’re super easy! They’re perfect for a Valentine’s party or for making for your sweetheart. 1. Preheat oven to 350°F. Line your cupcake pans with paper baking cups. 2. In a large bowl, combine cake mix, pink lemonade mix, eggs, oil, and water and beat for several minutes, until combined. Add a few drops of food coloring, until batter is the desired shade of pink. 3. Scoop batter into lined cupcake pans and bake for 15-20 minutes. Cool completely before frosting. 4. Frosting: In a large bowl, cream together the butter and shortening. Gradually add in the cups of powdered sugar and salt. Beat in the milk and add more powdered sugar if necessary. Add a few drops of yellow food coloring until it’s your desired shade of yellow. 5. Frost the cooled cupcakes with a piping bag or with a spatula. 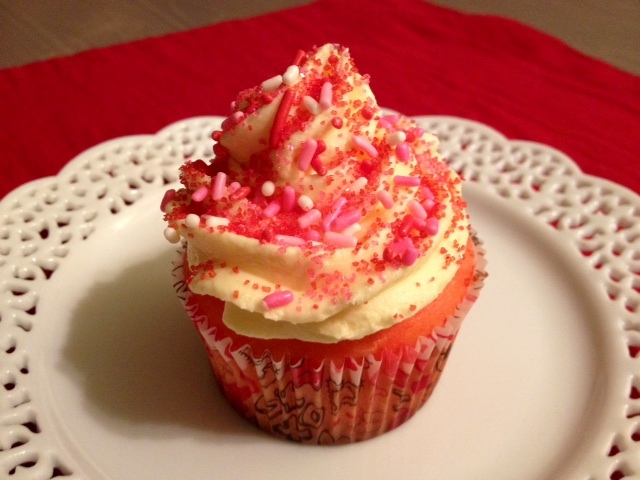 Decorate with optional sprinkles and edible Valentine’s decorations. It’s time to pucker up! Have a Happy Valentine’s Day!